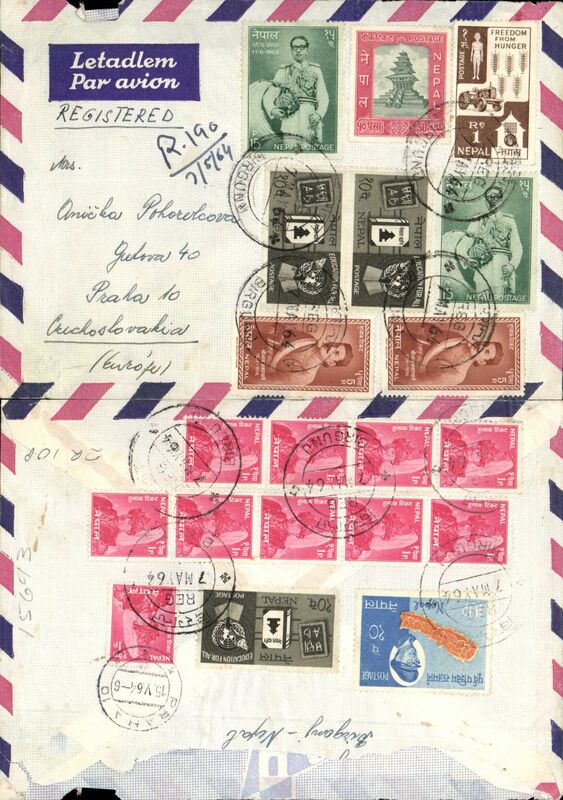 Nepal to Czechoslovakia, Birgany to Prague, bs 15/5, registered airmail cover franked 2R 10p (20 stamps, 12 verso). Upper part of flap with sender's name address has been removd neatly, otherwise fine. This is comon practice with mail of that period. 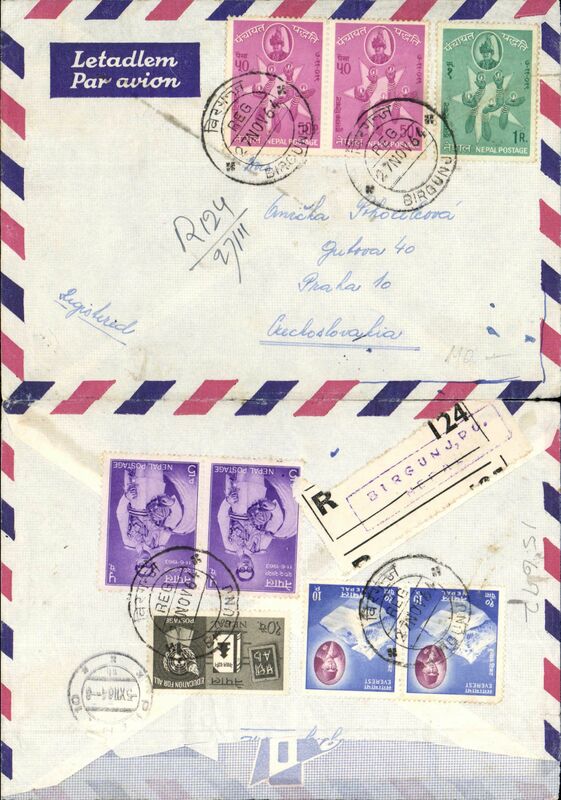 Nepal to Czechslovakia, registered (label) imprint etiquette airmail cover to Prague, bs 5/12, franked 1R+130p, canc Birgunj cds. Uncommon origin/destination. Upper part of flap with sender's name address has been neatly removed. This is comon practice with mail of that period. 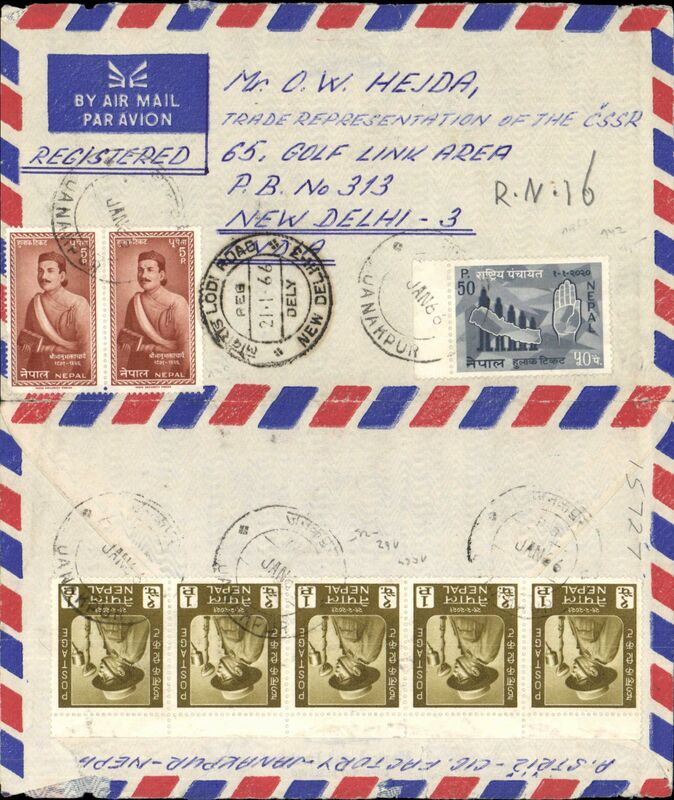 Nepal to India, imprint etiquette registered commercial airmail cover to New Delhi, 21/1 arrival ds on front, franked 65p, canc Janakpur cds. Please not the exact date of postage is unclear. Thai Airways International, Caravelle Jet, F/F Kathmandu-Calcutta, bs 4/12, company cachet, official souvenir cover. 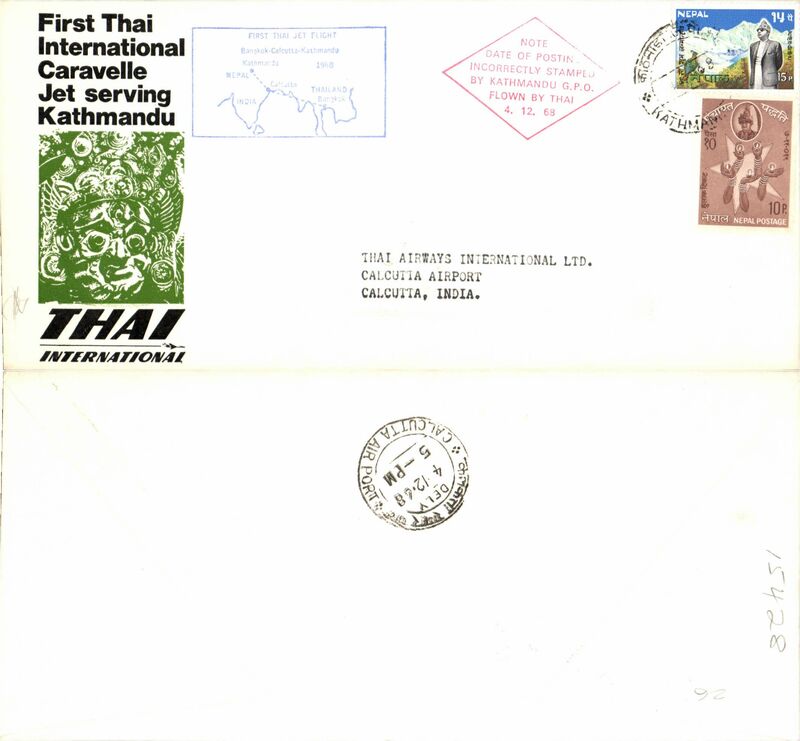 Thai Airways International, Caravelle Jet, F/F Kathmandu-Calcutta, bs 4/12, official souvenir cover (date of posting incorrectly stamped 4/7/68 by Kathmandu PO). 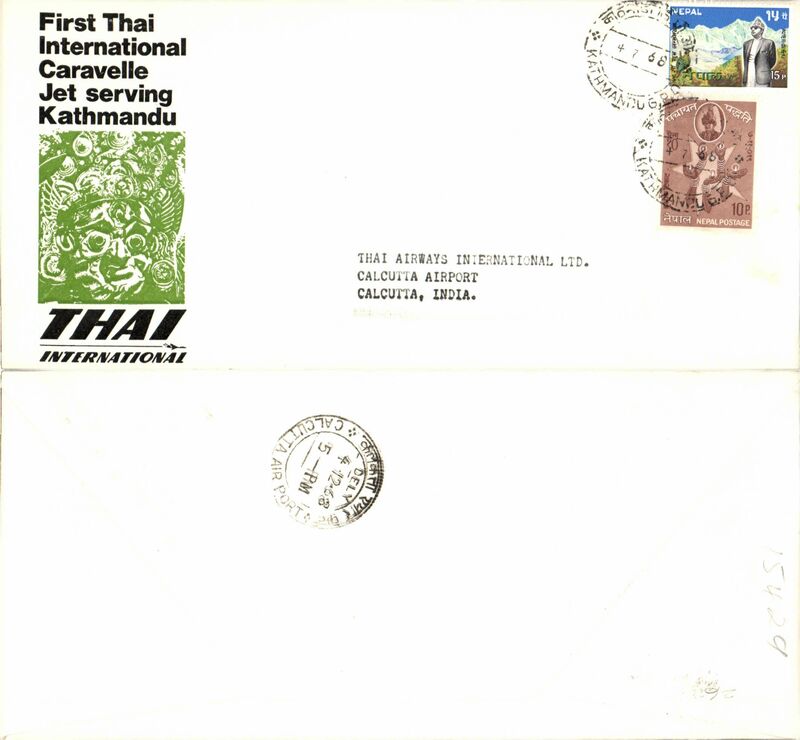 Thai Airways International, Caravelle Jet, F/F Kathmandu-Bangkok, bs 4/12, company cachet, official souvenir cover. 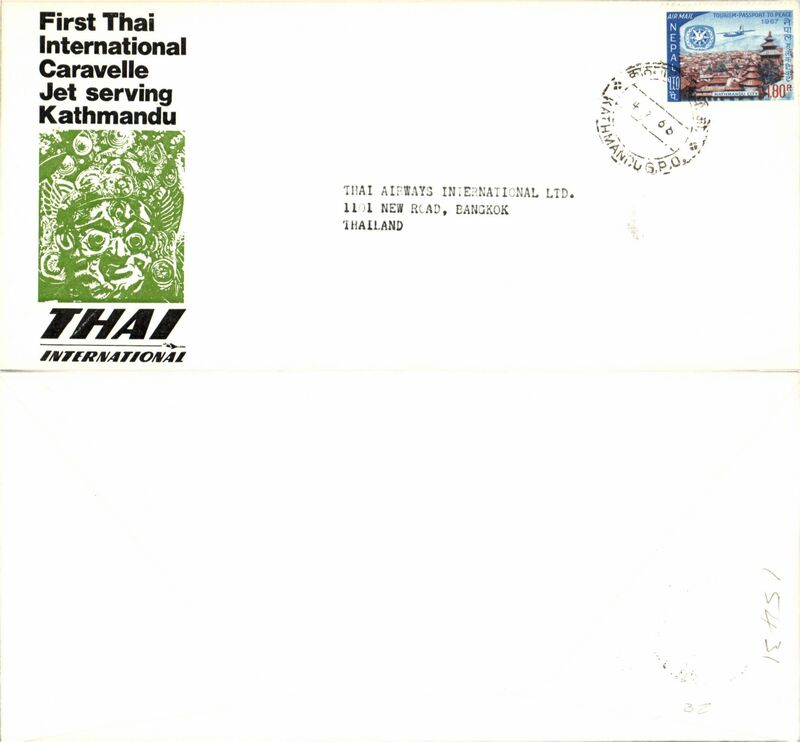 Thai Airways International, Caravelle Jet, F/F Kathmandu-Bangkok, no arrival ds, official souvenir cover (date of posting incorrectly stamped 4/7/68 by Kathmandu PO).